Please feel free to leave any comments at the end - It's really helpful to know how many people are 'out there', finding this class useful. An anxious Mum, re-presents her 13yr old son, for the second time, with chest tightness on exertion. You last saw him 8 weeks ago, when he described breathlessness and chest tightness, often on exertion (during football and running), but occasionally at rest as well. Despite there being no family history, you were fairly convinced this was asthma, and suggested a trial of inhaled bronchodilator, and a Peak Flow diary. The peak flow diary is unremarkable, and he reports no symptomatic benefit from salbutamol. You remain unimpressed by this tall, thin and healthy looking, active teenager, but mum seems unduly concerned. Under a little pressure you agree to do an ECG to reassure. After all, 14yr olds can't get angina.... Can they? Any more questions you want to ask? We can see P waves, and the rhythm is regular with a reasonable rate. What is apparent is the very large R and S deflections, with appearances of downsloping ST depression in the precordial leads. Could this ECG be just down to habitus? No. We've previously discussed ECG voltage criteria for LVH and how tall, thin, men and adolescent boys may have apparently large wave amplitude because of reduced impedence from the chest wall and soft tissue in electrode recordings. Hence the importance of checking the limb leads. If the deflections are similarly enlarged in leads I and aVL then remember that stature and habitus play no role in these leads. The reverse is also true. Genuine LVH is unlikely, if the large amplitude waves are confined only to the precordial leads. Always study lead I and aVL when considering a diagnosis of LVH. This ECG is highly suggestive of Hypertrophic Cardiomyopathy (HCM), and coupled with the symptoms reported I would get straight on the phone to a Paediatric cardiologist, or adult cardiologist with an interest in inherited cardiomyopathies to ask what to do next. His symptoms are relatively stable, but worrying - he does get symptoms at rest on occasions. Hopefully some telephone advice this evening will end in an agreement to have him seen in the morning when an ECHO and CXR can also be performed. I would ask him not to go out running - or play football - this evening! Most children and young adults remain completely asymptomatic, but HCM is a well recognised leading cause of sudden cardiac death in young athletes. For this reason, some advocate screening for HCM in young adults. However - screening ECG benefits are hotly debated. Angina. On exercise, or at rest when it is more severe. Despite normal coronary arteries, oxygen supply is insufficient to meet the demands of the thickened muscle. Palpitations. Secondary to arrhythmias generated by the abnormal muscle. Dizziness and syncope. These occur more commonly on exercise, but again, may occur at rest. (Secondary to reduced output or arrhythmias). Familial HCM is inherited in an autosomal dominant fashion, so children of an affected parent have a 50% chance of inheriting the mutation. Family history of sudden, cardiac death in a young adult is very important to establish. However, de-novo gene mutation is also possible, so lack of family history does not exclude HOCM. Asymmetrical Septal Hypertrophy can produce deep and narrow (dagger-like) Q waves in the lateral and inferior leads. LV Diastolic dysfunction (from a stiffened left ventricle) may cause Left Atrial hypertrophy, with signs of enlargement (P mitrale) on the ECG. There is some association between HCM and WPW syndrome, so a delta wave may be seen. Atrial Fibrillation and SVT's are common. Also Ventricular arrhythmias, such as VT/VF, can be a cause of sudden death. Teenagers and young adults are not likely to have Coronary Athersclerosis - but coronary artery disease is not the ONLY cause of angina. I've kept this very brief as I can't pretend to be an expert in HCM/HOCM - but if any experts out there want to add their penny's worth in the comments below, and shed some pearls of wisdom, that would be very welcome. Thank you! 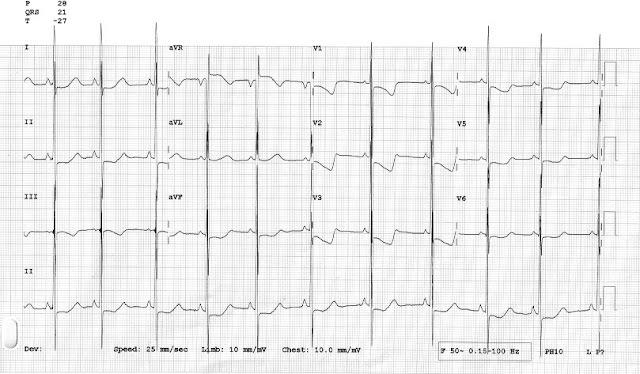 H.
#ECGclass Case 32 - A 13yr old with chest pain? After all, 13yr olds can't get angina.... Can they? Having seen the ECG, you call the patient and his Mum back in, and establish that there is no signifcant family history of heart disease. You specifically ask about sudden young deaths in the family, and Mum is aware that a paternal uncle drowned in his teens whilst swimming. You are a little more concerned now, and want to know more about his symptoms. He describes the chest discomfort as a tight band when he exerts - he feels like he can't breathe. It also occurs at rest. very rarely he had noticed a brief awareness of his heart beat but had thought nothing of it. There is no history suggestive of sustained palpitations. You revisits your examination. He is normotensive with BP the same in both arms. You think he may have a soft ejection systolic murmur and notices this is amplified on valsalva manoevre. It is quieter on held expiration. You know that the murmur of Aortic stenosis is usually louder on expiration so you find this odd. It's now 5pm on Thursday. You'd like a CXR - or better still an ECHO - but you know there is no way of getting an out-patient one this evening. Your practice nurse went home straight after doing the ECG so the only way you could get Mum's ECG is to do it yourself....and there are still more patients waiting to be seen. He's smiling as he sits in front of you, pain free and relaxed. Does anyone want to call the on-call cardiologist to chat? Does anyone want to admit him? Does anyone want to give him a CXR card to attend for a walk in CXR in the morning and refer to a paediatric cardiologist once the report is back? This 44yr old lady comes to see you in surgery complaining of stabbing left side chest pains. They are like 'a sharp needling pain' and last for a few seconds at a time. They don't radiate, and occur only and at rest, and never on exertion. She never experiences dizzy spells, or faints. She is an anxious lady by nature, and has a lot of social problems, but her father died in his 50's of a heart attack and she is worried about her heart. She has been getting these transient pains, on and off for several years. What do you think of the history? You note that she is a smoker, and takes low dose Citalopram for her long standing anxiety/depression, but is on no other medications. Examination is entirely normal. She is normotensive, with a strong, regular pulse rate of 80bpm. You note from her records that she had bloods taken 3 months ago for 'tiredness', which were all normal (including FBC, ferritin, Thyroid and glucose). 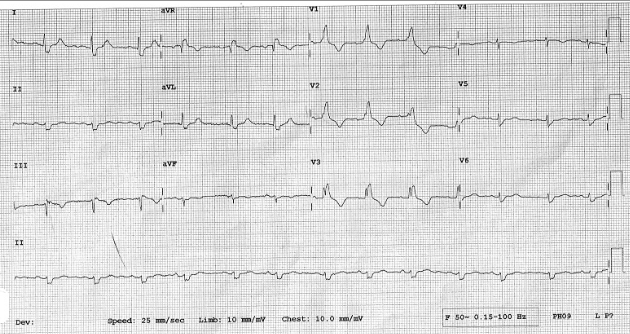 Clinically, you are confident these symptoms do not represent any significant underlying pathology, but would you do an ECG anyway? There are a couple of things to bear in mind here. Her symptoms are long standing, and are not suggestive of cardiac disease. Clinically, you were not worried. Citalopram might ring alarm bells for you, given its propensity to prolong the QT interval. History should be sought about other medications, including over-the-counter preparations which may interact. Whilst this is unlikely to explain her symptoms, it's worth checking the QT interval. See latest MHRA guidelines on safe maximum doses of Citalopram and interactions with other drugs which prolong to QT interval. QT interval in this ECG is probably best seen in lead I or II (tip - always select the most normal looking lead for calculations!) and is probably about 0.36 seconds (9 small squares) but certainly less than 0.44 secs (11 small squares) . It's normal. So what about the rest of the ECG? We can see P waves and the rhythm is regular. So this represents a sinus rhythm originating from the SA node. What about the QRS complexes? They look a bit odd, don't they. Looking in particular at the precordial leads, they are broadish - although barely, if at all, more than 0.12 seconds (Remember - they should be less than 0.11 seconds (under 3 small squares) in a rapid, healthy conduction pathway; but need to be > 0.12 seconds (over 3 small squares) to diagnose a complete Left or Right Bundle branch block. This 'in between' duration is often called a incomplete bundle branch block. So all you have to decide is, is it right or left? Note the terminal R wave in V1 and V2 (rR') and V3 (rSR). This pattern fulfils the criteria for Right Bundle Branch block. But we know it's not quite of broad enough duration to be a complete RBBB, so we call this an Incomplete RBBB. In a flash, you pull out your sticky-backed Axis calculator from your pocket, and calculate that this is a Left Axis Deviation (LAD). (It's somewhere between -30 and -60 degrees). A RBBB alone would not generate a LAD. When we see a Right Bundle Brach Block (RBBB) with a Left Axis Deviation (LAD), we call this a Bifascicular block. A Left Posterior Fasicular Block (LPFB) gives a Right Axis Deviation (RAD). So this lady has a RBBB+LAD = Bifascicular Block. But what does this mean to her? Both RBBB and Bifascicular block can be seen in healthy hearts. However, there is an association with underlying cardiac disease. LAFB can be seen in about 4% presentation with acute myocardial infarction (usually anterior or inferior). Clearly this well lady is not presenting with an acute MI. So what else? LAFB can also be seen with hypertensive heart disease, aortic valve disease, cardiomyopathies and degenerative fibrotic disease of the myocardium. (Pretty much the same list can be shared with LBBB, but replacing the 'Pulmonary Embolism' with 'Aortic Stenosis'). You look through her notes, and see that she had an ECG 6 yrs ago for a brief spell of palpitations. On reviewing her old ECG it looks exactly the same as today's. Given that this lady is clinically well and has no cardiac history. Significant underlying disease is unlikely, but an ECHO might be prudent. She went on to have an ECHO which was normal. Are any further investigations necessary? She has long standing ECG changes, with no alarming symptoms of syncope or dizzy spells. Her ECHO is reassuringly normal. However, there is a small tendency for bifascicular block to progress to a more sinister heart block. If she develops any new symptoms in the future - such as syncope or dizzy spells, then she needs urgent investigation and pacing would be indicated. There would have been a good case for not doing an ECG here! But you did. Whilst this dug up a whole heap of work for you, and worry for her, it didn't alter her ultimate management. These findings are incidental. In Bundle Branch Block, the T wave should be 'discordant' (i.e. deflected in the opposite direction) to the terminal deflection of the QRS complex. Full summary of interactive Twitter discussion will be shared next week.